Akemi discovered a loved of circus at The Actors Gymnasium in Evanston, Il when she was 8. She performed as an original member of The Actors Gymnasium Teen Ensemble throughout the Chicagoland area. In addition to training many aerial skills at The Actors Gym, Akemi also studied contortion with renowned contortionist, Oyuna Yadamjav. 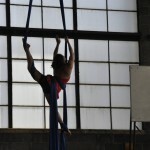 Akemi spread her love of circus after leaving Illinois, helping found the Oberlin College Aerialists. Now working towards her graduate degree at UMNTC, Akemi is excited to have the opportunity of joining the amazing staff at Xelias Aerial Arts Studio.